Many geography lessons have come and gone through my brain over the years. The Black Hills of South Dakota seem rather special however. It turns out the history of the Black Hills only goes back as far as about 1700. In 1743, explorers from France claimed the region. Sioux Indians dominated the Dakotas in the 1780s. The Fur Trade Era flourished between 1817 and 1857. Somehow the French and the Dakota Territory do not seem like a match or a lighter. Eastern South Dakota was settled in 1857, but the Black Hills remained a wilderness and rightfully Indian country. But when Lt. Col. George Custer and his troops arrived in 1874, they discovered gold! So, within 15 years, people flocked like sheep to the Black Hills, relegating the natives to “reservations.” Speaking of sheep, the bighorn sheep are found here, along with deer (and no antelope play), elk, pronghorn and mountain goats. The Lakota Nation, better known as the Sioux, have become known as the international symbol for all Native Americans. The Sioux gained control of the region in the 1700s. The Fort Laramie Treaty of 1868 (also known as the Sioux Treaty) guaranteed the Lakota would own the land and the hunting rights to the Black Hills. The Lakota call the Hills, “Paha Sapa”, or the “hills that are black.” The black comes from their pine-covered slopes that look as dark as shadows from afar. The needles are two-sided, with the dark or black side absorbing light. This provides the black to the Black Hills. The names and faces of the Sioux are familiar to most Americans through their history classes. The names are Crazy Horse, Sitting Bull, Red Cloud, Spotted Tail, American Horse, High Hawk, Hump, and Rain in Face. Today, the Oglala Sioux tribe make up about 14% of South Dakota’s population. Back to the Black Hills, where the highest peak is Harney Peak at 7,242 feet, the highest peak east of the Rocky Mountains. The area includes the Black Hills National Forest. Upon Custer’s discovery of gold, the U. S. government relocated the Lakota, against their wishes, to other reservations in western South Dakota. Unlike most of South Dakota, the Black Hills region was settled by European Americans. Today, the economy has shifted from natural resources to tourism and hospitality. The Southern hills contain most of the parks and monuments. 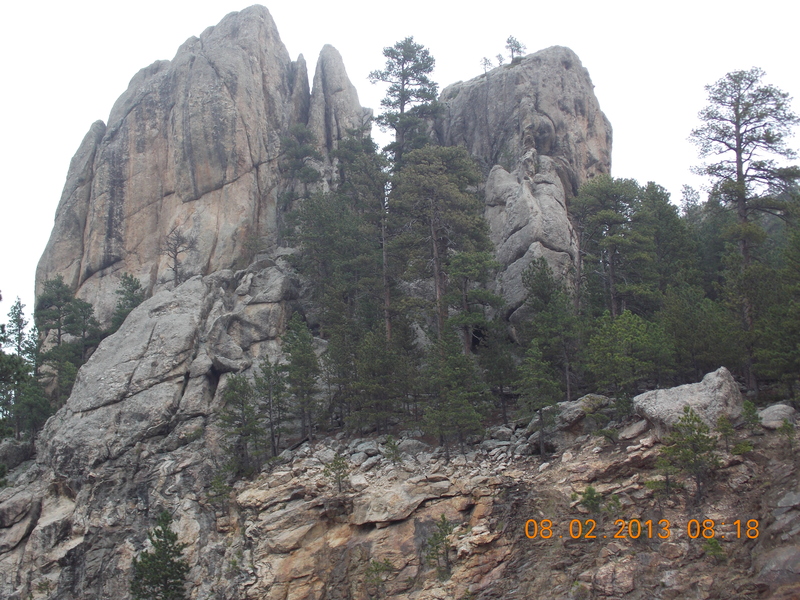 The Northern hills contain Deadwood and the famous town of Sturgis. Following the defeat of the Lakotas in 1876, the U. S. took control of the area, in violation of the Treaty of Fort Laramie. In the famous 1980 Supreme Court ruling, the Lakota were given $106 million for this land. They have refused, wanting the land returned to them. Meanwhile, the money sits in an interest-bearing account, having grown to $757 million. So, for non Native Americans, why are the hills called the Black Hills? The complex geography includes volcanic activity in the north. The south is characterized by granite, pegmatite, and metamorphic rocks. The granite core of the Black Hills goes back 1.8 billion years. 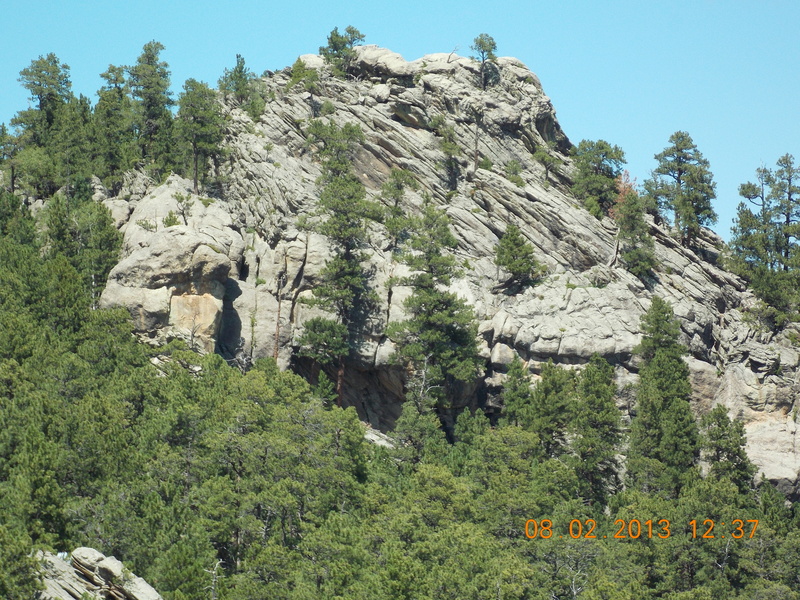 Skipping to the final layers, the Black Hills consist primarily of sedimentary rocks. This so-called Deadwood Formation is mostly sandstone, and was the source of the gold discovery. The Hills are forested with Ponderosa Pines, and Black Hills spruce. The forest contains 1.2 million acres of meadows and tree-covered mountains. Wildlife is quite diverse and plentiful. The forest has more than 40 trails with 920 miles for hiking, biking, horseback riding, cross-country skiing, and snowmobiling. The major city in the Black Hills is Rapid City, where upon we landed a few days ago. Unfortunately, the pines are slowing dying due to the pine beetle. It is a depressing site. But I did notice that Custer State Park was maintained much better than the Federal and open lands. My suggestion is that you need to see this great country before it is gone.